I’ve already explained that shopping cart abandonment is a problem that all ecommerce sites see to some degree. The rate at which your visitors abandon depends on how effective you have structured the checkout process. 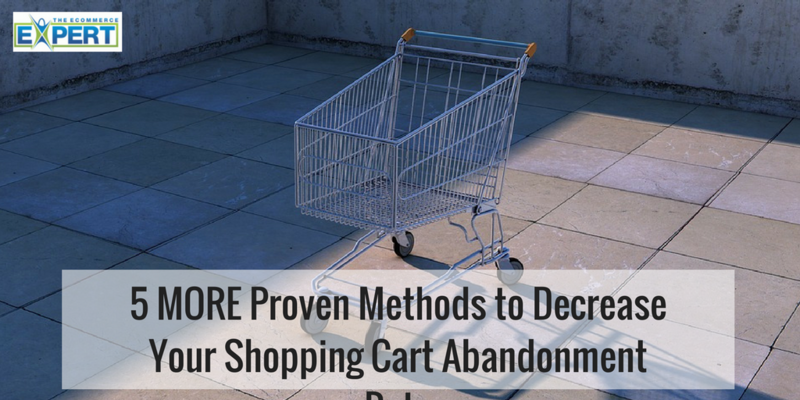 I offered you 5 proven methods to decrease your shopping cart abandonment rate in this article and here are 5 MORE. Clearly display your security and trust seals. Customers want to ensure the information they submit during an order is secure and protected. Make sure you clearly and plainly tell them that their transaction is secure and show them the seal to prove it. Don’t hide the seal at the bottom of a page or make it hard to find. In fact, tests have shown that adding a security seal within the user eye flow at critical times during checkout can improve conversion. Offer multiple payment methods including PayPal. Offering multiple payment methods opens up the number of people who will do business with you. Customers like choice and control. Providing them with the choice of multiple payment methods in addition to PayPal will help keep them in the checkout process. In fact, one in three shoppers expect to be able to pay with PayPal or at least be given that option in addition to other methods. Clearly state return and shipping policies. In survey after survey, shoppers say one of the big reasons they abandon the checkout process is due to the shipping charge or return options. Many sites don’t provide the shipping and return information to the customer until they are in step two or three of the checkout process. If the information they find there does not appeal to them they will leave. You can prevent this by offering them the shipping and return information at the first step of the checkout process or better yet from the page they are viewing their shopping cart from. Don’t require registration to checkout. This is difficult for some stores to implement because of the architecture their cart is built upon. However, if you have the ability to offer what is often called a “guest checkout” feature you should do so. For privacy reasons, there are a number of people out there who do not want you to save their information and it is those people who will leave unless you provide them with an option to checkout without registering. Following these and the other five methods for decreasing your shopping cart abandonment rate will not completely eliminate shopping cart abandonment at your site, but it should help in reducing it to a more reasonable level and increase sales.